>Using Fur yarn, cast on 32 stitches. Divide stitches onto 3 needles as follows - 16st (1st needle), 8st (2nd needle), 8st (3rd needle) - so that little 'spaces' that sometimes plague DPN use will be on the side seams of sweater and the 16 sts on 1st needles will make the sweater front. >>Sew sleeves on, weave in ends. I love the "cozy" for Santa's refreshment. This past Easter I made egg cozies--if things are quiet, they sure spice up the conversation. This one might be good to put with my Thurs. night group gifts--maybe an individual champagne and orange juice for a morning when each feels they want to be special. It's a great Summer of Stash project. 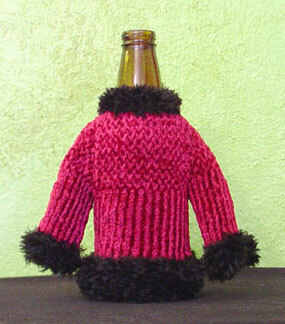 Would love to knit the Santa's Little Beer Coat, but can't seem to find the pattern at Spunmag.com. Please help - tried 4 times to locate article 051230 Santa. It looks like Spunmag finally stopped paying for the domain name... Should be fixed now!